This watch laughs in the face of those who are looking for a mere "timepiece." This thing is waaaaay more. It's more than an altimeter and barometer that sends alerts if conditions change more than you're expecting. It's more than a compass and weather forecaster. That's right, Dr. Brown. This Delorean of a chronograph is the Suunto X6HR Heart Rate Wrist Top Computer Watch with an Altimeter, Barometer, Compass, and a longer name than a Russian gymnast. 1. 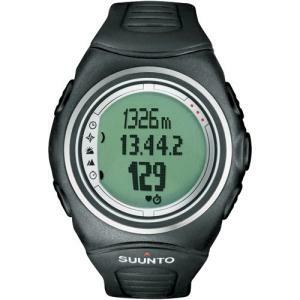 It gives immediate information on the user such as heart rate. 2. It syncs with a computer to allow the user to share information with other cross-sports enthusiasts who also are users of the futuristic device. 3. It even comes with software to allow the user to visualize their own health profiles -- even allowing a person to track their own training diary. For the golfer, it may be overkill (especially at its price tag), but for the sports enthusiast who leaves their golf round to go right into a marathon, rock climbing contest, or bike race -- it may be an incredible fitness-tracking solution.